This post is almost a couple of months old, but on the back of ‘Generations #2’ it is timely to reblog I think. 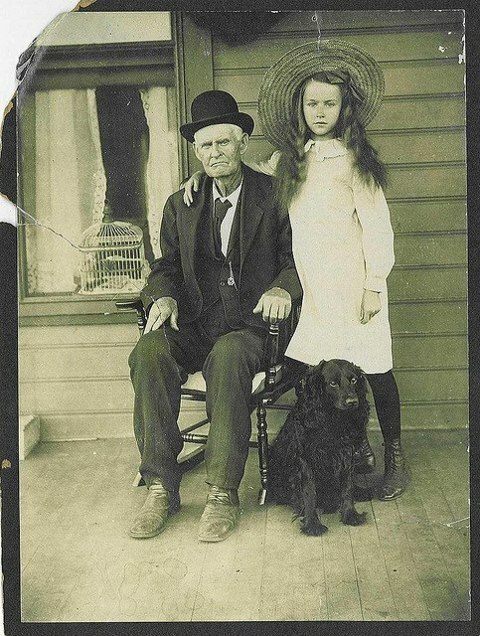 And I love the photo-I often wonder what kind of life Mary went on to have . from each other, and from you. fades the memory of us, too. and came soon to a place to grieve. When she received the news that she had cancer, she decided against having combative treatment, citing her age and her health. She told me that she didn’t want anybody’s pity, and that she had had a good life. My immediate thought was that there is not a lot of people who, having been an orphan at a very young age, and being widowed twice, would look back and say that they had had a good life. On the day of her death, she told her grown up granddaughter that she would be happy to go tonight, that the time was right. I hope when it is my time, I can stare my own mortality square in the face with similar levels of acceptance, of reasoning, of faith. There were no recriminations, no regrets. Hers was a peaceful, natural end to a life filled with laughter. That makes things easier. When we are with others, we sit in the blazing light of their presence, filled as they are with personality and vitality. And life. 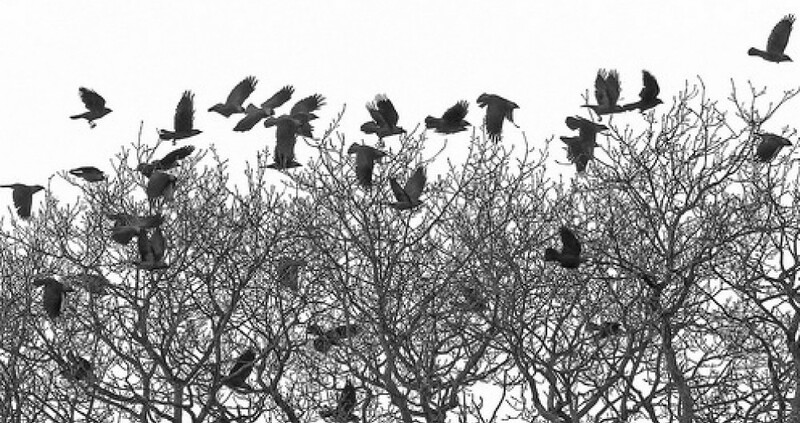 When their essence leaves us, we are suddenly confronted by the shadow of their absence. If we are attentive, we can follow still the wake of their journey, track the fading trails of light as they sink over the horizon. 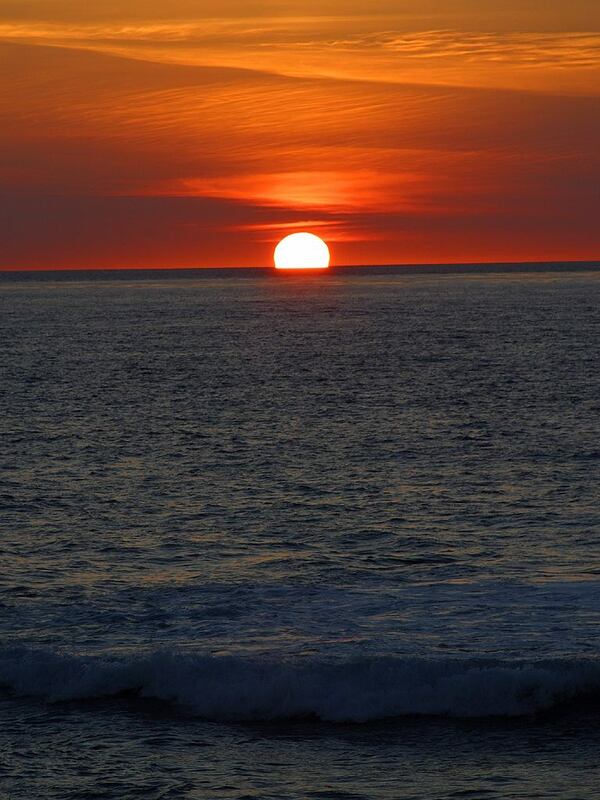 We can close our eyes, and feel still the warmth on our face. Sorry, that was a feeble attempt to make a tenuous link to a previous post (July 18)) about Agnetha Fältskog and Abba. Here is a photograph I came across on Find My Past UK. 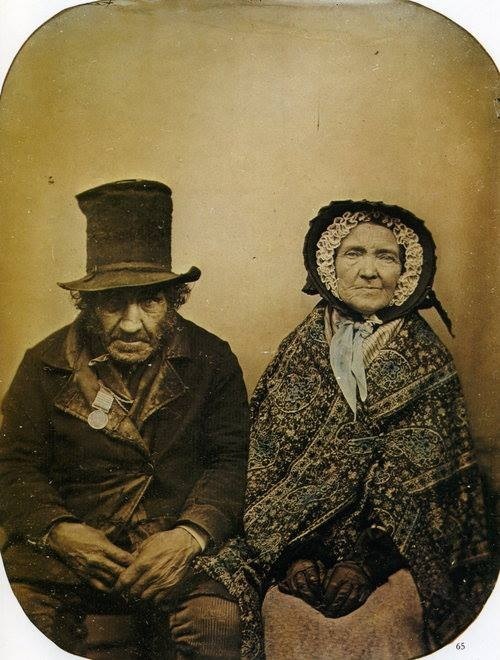 This man, wearing his campaign medal and sitting with his wife, is described as ‘one of the last surviving veterans of the Battle of Waterloo’. There is a worldly weariness about them both, don’t you think? Wrapped up against the cold. Wrapped up in resignation. 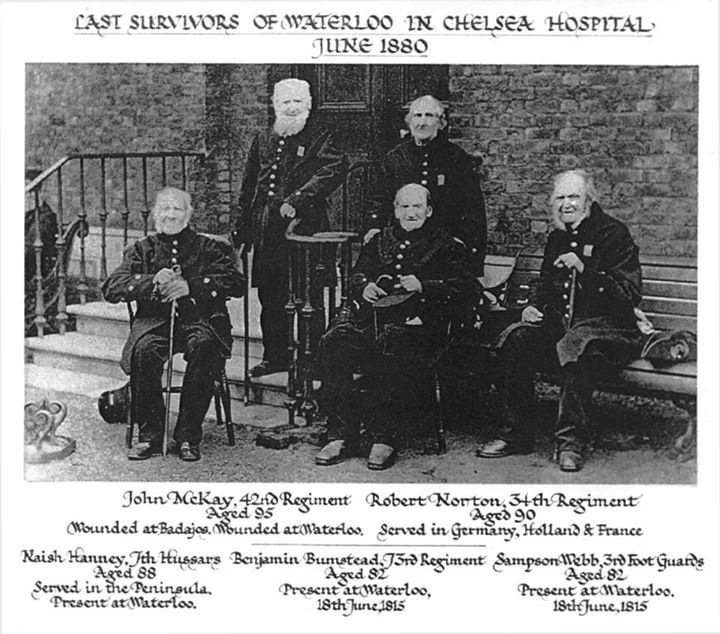 Waterloo took place in 1815, and the photograph is stated to have been taken in 1850. If that date is correct, then there must surely have been other survivors around at the time, particularly when you compare it to the next photograph, which would have been taken around thirty years after the first one. It is dated June 1880. Only recently we have lost the last surviving veterans from World War One, when living memory faded into historical narrative. Events are no longer within touching distance. It’s a reminder that all of us are just passing through eras, be they times of peace or times of war. Periods phase out, the world keeps on turning. We all move on, casting shadows. And I have met my destiny in quite a simil-NO!! That’s Abba again! Forget Eurovision everybody. Pass safely through this weekend, earning your own medals and plaudits. May your shadows be long. Summer is here. At this time I can just step outside and look high into the sky to see Swifts gliding at a great height above as they feed on insects. Swifts are, well, swift, never seem to be still, and even sleep on the wing. Unfortunately my local vantage point never offers anything as dramatic as this photograph does. In his time as a City supporter during the fifties,sixties and seventies, my Dad saw two great teams. One was the cup team that made it to the FA Cup Final in the consecutive years of ’55 and ’56. The other was the Mercer-Allison team that won several trophies in the late 60’s and early ’70’s. A team which boasted such great players as Bell, Young, Lee, and Summerbee. Great though these players were, when pressed he always said that his favourite all time player was Bert Trautmann. Held here in Britain as a prisoner of war, he declined to return to his homeland when the war had finished, marrying a local girl. When Manchester City signed him to be their new goalkeeper, there was a lot of animosity directed towards him due to his German roots, the local Jewish community, as well as the general public, angry at his arrival.This was just four years after the war. Especially at away games he drew a lot of vitriol, but slowly, gradually, he began to win people over with his great, courageous displays. Playing in London for the first time, he received a hostile reception, enduring shouts of ‘Kraut’ and ‘Nazi’. In this match he was particularly brilliant, and when the game ended he received a standing ovation from the crowd, while the players from both teams formed lines to applaud him from the pitch. That slow transformation of how he was perceived by the post-war British public spread. 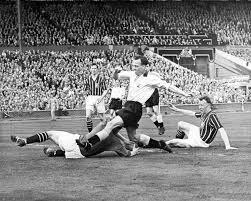 His most famous moment, which seems to overshadow the rest of his extraordinary life and career, came in the 1956 FA Cup Final at Wembley, when he was injured rushing out to block Birmingham’s Peter Murphy, diving at his feet. After receiving treatment he played on, making further crucial saves despite being dazed and in obvious pain. He helped his teammates win the match and thus lift the trophy. It was three days later that it became apparent that he had played the last seventeen minutes of the match with a broken neck. He had dislocated five vertebrae in his neck, the second being cracked in two. The third wedged against the second, preventing further damage which could have cost the German his life. My Dad was at that game, and often told me the story, of how, unknown to him the extent of his injury, Trautmann risked his life by again diving at the feet of an oncoming attacker. Broken neck and all. That was probably the final cementing into public affection the figure who had provoked so much anger and hatred at the start of his footballing career in England. Just a few months after this match, Trautmann was to suffer the tragedy of losing his firstborn son in a car accident, aged just five years old. His role in restoring English and German relations acknowledged, Trautmann was awarded the OBE in 2004. 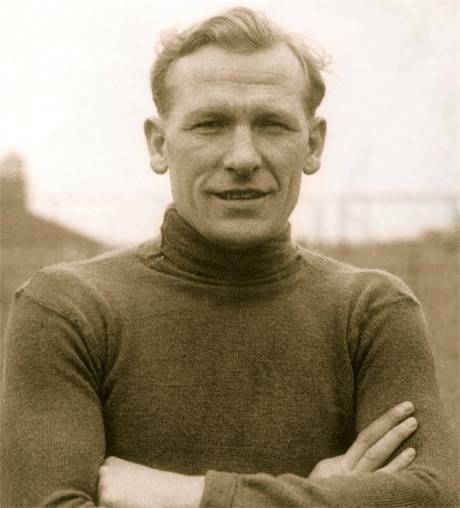 I am too young to have ever seen him play, but I have been at Manchester City matches when Trautmann has attended and been announced onto the pitch either before the game or at half time, and have witnessed the obvious affection and high esteem in which the supporters, particularly the older supporters, held him. He once said that he was born in Germany, but that in his heart he is British. A legendary figure both on and off the pitch, I have had his biography for some time but haven’t got around to reading it yet. I think now is the time. 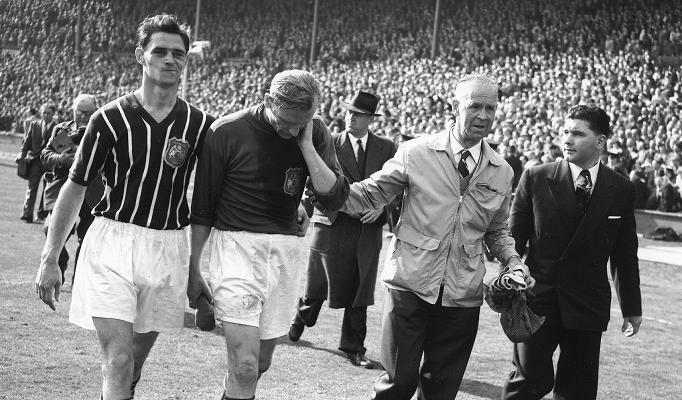 Here is the footage of Trautmann’s finest hour-the 1956 FA Cup Final. See the supporters with their rosettes, rattles and Woodbines. A one-armed referee. That something for me goes by the name of Agnetha Fältskog. When I was young , way too young to understand what was cool, music in the seventies consisted of whatever existed in my Mum and Dad’s cassette and record collection. Cassette and record. I may as well be talking about the gramophone now. In those half-glimpsed scenes from back then I can recall listening to Brotherhood of Man, The Seekers, Bay City Rollers, Gilbert O’Sullivan, and Abba, as my brother and I played drums on an upturned bin or biscuit tin. (Constant Friend tuts, carries on listening to Slade). At that age, five or six, the corny lyrics written by the two men were just catchy and appealing, and it was the energy and the perfectly complimentary voices of the women that I liked. Then, as I got older, it was one of the women in particular that I liked, the quintessential Nordic blond, Agnetha. I hate the word crush, it sounds all puppy dog and juvenile, but I was young, and definitely juvenile. And forming a crush is all part of growing up, although I think the kids these days are starting earlier. I have a daughter who at six years of age tells me constantly how fit Olly Murs is. (Constant Friend shakes his head, Space Dust crackling on his tongue). These moments are fixed and immortalised in my mind, my young mind, in my denial untouched by the passage of time. But then, suddenly, out of nowhere, it all comes crashing down. Agnetha steps back into the public eye, breaking her self-imposed exile from the limelight, to promote a new album. And, almost as an aside, it is mentioned that the blond, fresh-faced, forever fixed around 1978 beauty is now 63. That stopped me dead in my excitable tracks. The same age as my Mother-In-Law. Reality washed over me cold. Walls came tumbling down. Admittedly, she still looks good for her age. But there is no getting away from the fact that my original pin-up girl is now a pensioner. Well, she would have been my pin-up if my Dad would have trusted me with tacks. I am sure that there is an element of air brushing going on here, but still, the rate that the two of us are aging I reckon I will soon be overtaking her and could pass as her Dad. Or at least her elder brother. (Constant Friend agrees, continues to shuffle his Star Wars bubblegum card collection). Now my bubble of immortality was well and truly punctured, I began to cast my mind back three decades or so. Who else did I used to like back then? Erin. 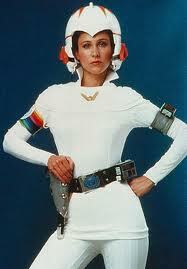 Erin Gray from the great Buck Rogers in the Twenty Fifth Century .Full of foreboding, I fearfully began to Google from the suddenly shaky ground of the twenty-first century. That’s no good, get rid of the silly hat. That’s the one. Now, what does Wikipedia say? On the plus side, she is still with us. The same age as Agnetha. You hear that, Twiki? Colonel Wilma Deering is now a pensioner too. 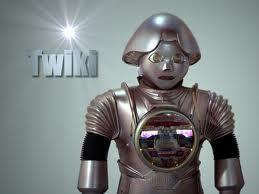 And no, before you ask, Twiki never did it for me. (Constant Friend stops eating his Kop Kops, raises a quizzical eyebrow). Listening to Agnetha’s new album I was touched-this woman who had been written off as some kind of reclusive and eccentric Garbo, said to have turned her back on music, refusing to leave Sweden because of her paralysing fear of flying, was now in my country promoting her new material. She was singing about being back on our radios again. And she still has that beautiful voice, capable of evoking so well a feeling of fragility and vulnerability. (“Wuss”, says Constant Friend, lay on his bed, hands splayed behind his head, gazing up at his Wonder Woman poster). If I just close my eyes and listen, nothing has changed.She still has the moves. I have yet to shave. In a bid to perpetuate the myth of youth, both for her and for myself, and forever anchor myself to a time long gone, I post this video now of how I remember her then. She, the Girl With The Golden Hair, and I, the Boy With The Full Head Of Hair. The world was bright, and colourful, and young. (Constant Friend glances over at the video, nods his understanding).